carly. . Wallpaper and background images in the iCarly club tagged: icarly miranda cosgrove. 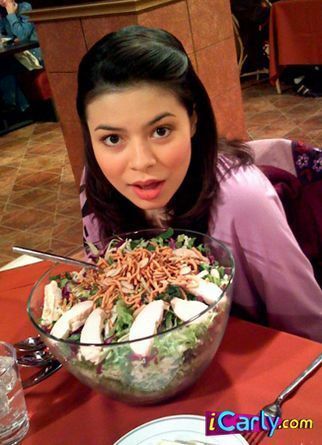 This iCarly photo contains antipasto and एंटीपस्ता. There might also be विभाजित करें, विभक्त करें, बनाना स्प्लिट, केले के विभाजन, टूटी फ़्रूटी, and tutti फ्रूटी. How did Sam Eat that HOLE thing?